The GIZMO can transmit, receive, save and playback scenes, and perform a variety of data and cable tests. It features a rugged 1/10" aluminum enclosure, a 16 character by 2 line back lit display, an optically isolated input, a slew-rate limited output, a NiMH rechargeable battery good for four hours of continuous testing, and a five year warranty. A nylon carrying case and AC adapter/charger are included. The full numeric keyboard provides direct channel access and level setting without the need for scrolling. 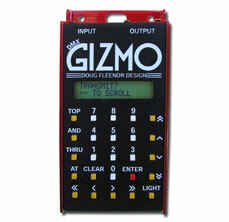 Up to one hundred scenes can be stored in the GIZMO. These can be captured from incoming DMX or built using the AND, THRU and AT keys.